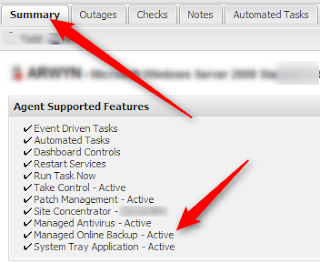 Managed Online Backup (or MOB) can be deployed through GFI MAX to clients that want only backups. By following the information below you can use just the backup for your clients and be charged only for backup . ATTENTION! If the system is not set correctly beforehand additional charges may apply. Read our article "Naked" MOB Setup regarding what NOT to turn on so you are not charged anything additional. Once the system is set correctly, simply follow the steps below to create a MOB only deployment. Before using MOB a backup manager will need to be installed on your local machine to open the backup interface. b. Expand the tree to your client and site (workstations and servers) that will accept MOB only and turn the setting to “On”. a. Once the agent checks into your dashboard there is a tab called SUMMARY tab in the lower right quadrant of the dashboard.